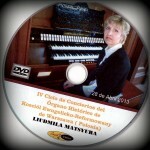 Throughout her long career Liudmila Matsyura has made many recordings Video – DvD and audio – CDs during concerts at major cathedrals such as Notre-Dame de Paris, Dom zu Salzburg (Austria), Basilica of St. Bonifaz Munich, Paderborn (Germany), St. Gile’s Cathedral Edinburgh (Scotland), Domkirke Stavanger (Norway), Cathedral of Moscow (Russia), etc. in different Spanish cathedrals as Palma de Mallorca, Salamanca etc., and the various basilicas, churches and auditoriums around the world. In these recordings variety of composers and styles of music as part of his large repertoire as a performer, which includes ancient, classical, romantic baroque and contemporary music is reflected. 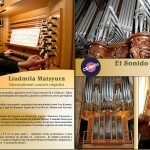 By listening to these recordings we can enjoy the variety of sounds of different organs in the hands of the concert. Most of these discs are recorded live during concerts. In them we can better appreciate the lively, expressive and musical taste interpretation that has this organist.